I can’t speak for everyone but I myself feel a little heavier after the season of celebrations and feasting. Sure I tried to make healthy choices over the holidays but the temptation to eat rich foods and decadent desserts are hard to pass up. That is why at this time of year I make a few New Year’s Resolutions that are both attainable AND delicious!...I’m talking about healthier grilling for a happier new year. One of my favorite and “feel good” dishes to grill at this time of year is a vegetable stacked “Napoleon”. This particular dish is composed of layers of grilled fork tender potatoes, vibrant asparagus, skewers of tender grilled chicken, crumbled goat cheese and then finished with a drizzle of tangy lemon-tarragon vinaigrette. When all the ingredients come together hot off the grill, it is a flavor combination that is unrivaled! Perhaps it’s the citrus flavors and scent of fresh vegetables grilling away that help remind me that spring & summer is around the bend. At any rate this particular recipe puts a skip in my step during these frigid months of winter and I hope it does for you too! Here are some tips to get you through this grilling adventure! Happy New Year & Happy Grilling! Tip#4- Try substituting a grainy mustard instead of a creamy Dijon mustard…the texture, taste and a visual appeal is outstanding! For the chicken skewer, you can make your favorite. Here are some recipe ideas. 2. In a medium bowl whisk the lemon juice, tarragon, mustard, ¼ teaspoon salt, and ⅛ teaspoon pepper. While whisking, gradually add ½ cup oil to make a smooth emulsion. 3. Remove and discard the tough bottom of each asparagus spear by grasping at each end and bending it gently until it snaps at its natural point of tenderness, usually about two-thirds of the way down the spear. 4. Bring a medium saucepan of salted water to a boil over high heat. Trim the bottom off one end of each potato so it can stand vertically on the cutting board without rolling. Cut the potatoes lengthwise into ¼-inch slices. Reserve the twelve largest slices, and discard the remainder or save for another use. Add the potato slices to the water and reduce the heat to medium. Simmer just until almost tender, about 3 minutes (do not overcook). Drain carefully, rinse the potato slices under cold water, and pat dry with paper towels. Drizzle 2 tablespoons of oil on a sheet pan. Add the potatoes and asparagus to the pan and turn to coat them with the oil; season with salt. 5. Brush the cooking grates clean. Grill the potatoes and asparagus over direct medium heat, with the lid closed as much as possible, until the asparagus is browned in spots but not charred and the potatoes are golden brown and tender, 6 to 8 minutes, turning once after about 4 minutes. Remove the vegetables from the grill as they are done. Cut the asparagus into bite-sized pieces. 6. 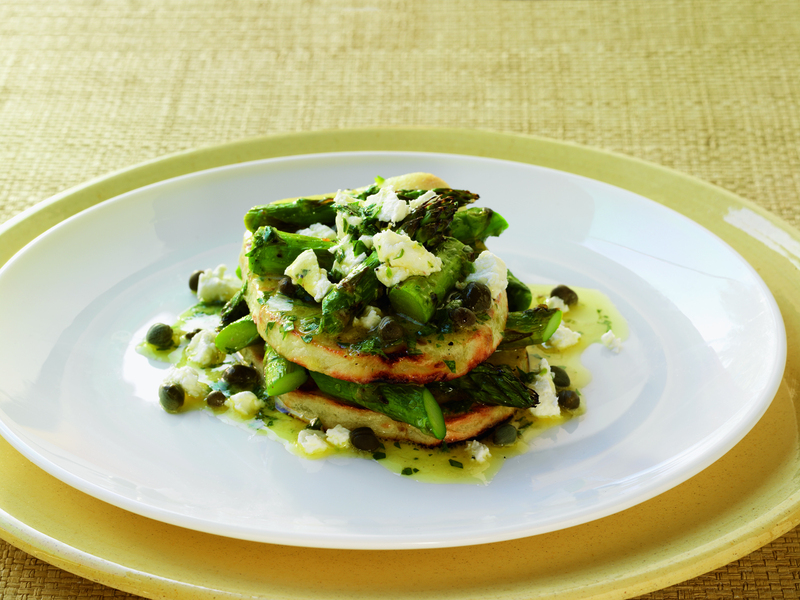 Place one potato slice on each of six dinner plates and build the Napoleons evenly with half of the asparagus, another potato slice, the remaining asparagus, cheese, and capers. Whisk the vinaigrette again and drizzle about 1½ tablespoons on and around each Napoleon. Serve warm. Access the grocery list for this recipe on your mobile device. timetogrill.mobi.